First-time Homebuyer? A Top Producing Loan Officer Can Help! The journey to becoming a first-time homeowner can seem overwhelming. Finding your potential home is the fun part – but going from shopping to owning is a process that is much easier with a trusted lending partner at your side. Each year, VHDA honors those dedicated loan officers who have gone the extra mile to help Virginians achieve their dream of homeownership. VHDA’s Top Producing Loan Officers are experts in helping first-time homebuyers. For example, they have information on VHDA Programs like the popular “Loan Combo,” which includes down payment money and more. VHDA offers a variety of affordable mortgages for all types of homes including manufactured homes, townhomes and condos. A Top Producing Loan Officer is familiar with all these programs and can help you select the one appropriate for your situation. They can give you advice on how to improve your credit score so that you quality for the loan you need. They also offer VHDA’s free homebuyer class. Available online or in person, the class covers everything you need to know to become a successful homebuyer. So if you are thinking about buying a home, or are ready to see how much you qualify for, reach out to a VHDA Top Producing Loan Officer today. Operation Homeownership – Free homebuyer classes geared especially for service members and their families, to help them become savvy homebuyers and owners. Classes are presented by VHDA’s Housing Education team, military financial educators and local area subject matter experts. Topics include Personal Finances, Credit and Credit Reporting, Working with a Lender, the Role of the Real Estate Agent, the Home Inspection, Loan Closing, and the benefits of developing a savings and spending plan. Operation Homeownership addresses the unique issues service members must consider before deciding to buy a home. VA Home Loan Program – VHDA carries on a proud tradition that began in 1944 when President Franklin Roosevelt launched the Veterans Affairs Home Loan Program (also known as the GI Bill of Rights). Today, the VA Home Loan Program helps eligible and qualified active duty service members, veterans and survivors of veterans to obtain mortgages for up to 100 percent of a home’s sale price so they don’t have to spend years scrimping and saving to make a big down payment. VirginiaHousingSearch.com – This free website is a big help to those searching for quality, affordable rental housing. The site includes a link to find veteran housing (rental homes whose landlords are interested in renting to veterans or Veterans Affairs Supportive Housing (VASH) recipients). Visitors to the site can use a variety of filtering tools to find homes that will best suit their lifestyle, as well as accessibility features, if needed. "How to be a Successful Renter” – Download this free eBook at vhda.com/RenterEd. It answers many questions renters have, such as how to find the right place to rent, navigating leases and applications, tenant rights and responsibilities, how to get a security deposit back, and much more. Cell Phones for Soldiers – VHDA has participated in the Cell Phones for Soldiers no-cost recycling program since 2010 as part of our internal “Go Green Initiative” within our own buildings and the communities we serve. So far, we’ve donated 522 phones to recycle, which buys calling cards for our troops. Each phone valued at $5 equals an estimated 2.5 hours of free talk time. This effort was launched in 2004 by 12- and 13-year-old siblings Robbie and Brittany Bergquist, and to date has provided more than 300 million precious calling minutes for our troops around the world. Learn more about VHDA’s programs and loans for the military at vhda.com/Military. “Operation Homeownership” is the name of VHDA’s partnership with the U.S. military to provide free homebuyer classes for active duty personnel, reservists, veterans, National Guard and Department of Defense personnel and their dependents. It launched in 1998 and is still going strong. The program helps service members stationed in Virginia and their families, as they consider the prospect of homeownership. We celebrated the 20-year anniversary of Operation Homeownership with a ceremony in Norfolk on May 14, 2018. The event was held at Nauticus and attended by representatives from military command, service personnel and their families, program volunteers and elected officials. Chief Petty Officer Mario Santiago, who is now retired from the U.S. Navy after a long career, spoke to the group about how Operation Homeownership changed his life 20 years ago. After attending VHDA’s first military homebuyer class, he used what he learned to qualify for a VHDA mortgage and buy his first home, where he and his wife still live today. It takes a lot of committed people to keep Operation Homeownership running smoothly. The 20-year celebration at Nauticus gave us the opportunity to thank those who have helped make this program a success. We awarded plaques and medals to our Housing Heroes (the people who have helped coordinate classes on military installations), and we recognized individuals from the private sector who have volunteered countless hours to help teach. Operation Homeownership began as a partnership with the U.S. Department of the Navy. Over time, it grew to include more than 3,700 participants from all service branches who attended more than 300 classes to become educated homebuyers and responsible homeowners. VHDA’s housing education team works on-site with military financial educators to teach topics that include Personal Finances, Credit and Credit Reporting, Working with a Lender, the Role of the Real Estate Agent, the Home Inspection, Loan Closing, and the benefits of developing a savings and spending plan. Operation Homeownership also addresses the unique issues military homebuyers face. For example, the military lifestyle is typically transient, so service members must decide if buying a home is a good idea for them, and have a Plan B in place in the event they must relocate. Qualifying for loans may be complicated by calculations of a military housing allowance/allotment and any pending retirement income. Military homebuyers also need to learn about the VA loan program’s benefits and eligibility requirements. Service members who attend Operation Homeownership classes have the opportunity to meet local real estate agents, lenders, home inspectors and other industry professionals in the classes. These professionals are able to provide valuable insights on neighborhoods, schools, recreation options and more. This is especially beneficial to recently deployed service members who are new to the area. Those who complete the class receive a Certificate of Completion and a copy of VHDA’s Homebuyer Handbook for future reference. Granting Freedom program, providing grant money to help disabled service members and veterans make their homes more accessible. VirginiaHousingSearch.com, a housing search site listing homes and apartments for rent throughout the state, including housing for veterans. Cell Phones for Soldiers to provide free phone time to those on deployment. What's the cost of vacant property? More than you may think. Many Virginia communities face challenges from vacant, blighted, abandoned and often tax delinquent property. Not only do these properties reduce the value of nearby homes, they also reduce tax revenue to the locality, strain municipal services, facilitate crime, reduce neighborhood stability – and even negatively impact public health. Fortunately, many localities across the country have developed and implemented effective strategies to transform these community liabilities into community assets. Join national expert Kim Graziani from the Center for Community Progress to explore recent innovations, best practices and success stories in addressing blight and vacancy. Representatives from Richmond and Danville will also describe the goals and activities of their recently created land banks - a new tool in Virginia made possible through 2016 enabling legislation. The session will include the opportunity to discuss unique local issues - and possible creative solutions - from communities around the state. The session will be held at the Richmond Association of Realtors on May 22nd. It will run from 11am to 4pm. This blog post was written by the Maggie Walker Community Land Trust, a Housing Virginia partner. The Preliminary Rankings list for the 2018 Housing Credit Reservation applications received by VHDA on March 16, 2018, is now available. This layout includes a “Preliminary Status” category in the last column designed to explain what is taking place with each development within the given pool. In a change from recent years, all individual scoring sheets are available on VHDA’s Housing Credit Program website. This is where you will be able to access deal-specific scoring information. The comment period has ended, and a rebuttal period will take place from May 9, 2018, through May 16, 2018. Final rankings will be posted in June following the VHDA Board meeting. A scanned copy of all applications received is available on our Business Partners website. If you have not registered to view these applications, please feel free to do so now. Once you have registered, you will be given a temporary password and granted access to view them. Please remember these are preliminary rankings and are subject to change(s) following the comment and rebuttal periods. In 2018, VHDA is expanding our outreach efforts by hosting roundtable discussions with our partners, right in their own communities. Face-to-face contact helps us connect and encourage partnership opportunities while spreading the word about our revamped Capacity Building and Sponsorship programs. Sessions have been coordinated and presented by our Community Outreach Division staff in Wytheville, Chesapeake, Richmond, Roanoke and Falls Church. We met with our partners in Danville via webinar. Attendees at the events represent various facets of Virginia’s housing and service delivery network, including local governments; planning district commissions; redevelopment and housing authorities; for-profit developers; nonprofits and organizations providing services such as rehabilitation, housing counseling and community development — all share a mission to support creation and preservation of affordable housing. To encourage our partners’ cooperation in striving for our strategic goals, we discuss VHDA’s overarching mission of providing quality, affordable housing and the importance of the delivery network, stressing opportunities to improve capacity. Participants get a basic overview of all VHDA services, from homeownership creation to preservation and development of affordable rental housing and mixed-use/mixed-income projects. More in-depth information is provided on our Community Outreach programs, including Housing Counseling, Sponsorships, Community Impact, Pre-Development, Capacity Building, Community Housing Revitalization, Granting Freedom (our accessibility grant program for disabled veterans), Rental Unit Accessibility Modification and Housing Education. These events also allow us to hear from our partners about issues they are experiencing and get their input on how VHDA can support them in their housing and community development efforts. Some common themes we hear from areas across the state include challenges with organizational capacity, the volume of rehabilitation needed in existing housing coupled with increasing demand for improvements in accessibility, as well as the difficulties faced in serving low- and extremely low-income individuals. Our partners’ feedback has been positive. They appreciate our visits to their communities and our efforts to improve access to VHDA resources. We’re compiling all the feedback and suggestions into a report to help us develop more ways to expand our outreach and improve operations. These roundtables have been so well-received, we’ve decided to host them annually. In the future, we intend to include our sister agency, the Virginia Department of Housing and Community Development, so we may provide roundtable participants an even more comprehensive review of housing resources available to them. 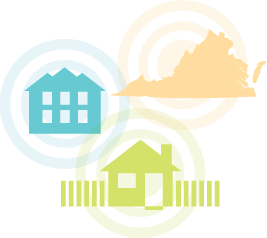 Over the last six months, Housing Virginia convened a series of regional discussions to address housing needs in different parts of the state. Associates from VHDA’s Community Outreach Division participated in the events, which brought together local elected officials, planners, landlords, private developers, housing and social service providers, representatives from the U.S. Department of Agriculture – Rural Development, the Virginia Department of Housing and Community Development, and other state agencies. Topics of discussion included the shrinking supply of affordable rental units, a review of existing housing programs and services, and how well the needs of localities are being met. Each session was tailored to the specific needs of the area in which it was held, and different themes emerged for each region. Oct. 19, 2017 - Project Faith / King George County Housing Summit: This session focused on Project Faith’s single-family homeownership pipeline and how to prepare potential buyers early so their creditworthiness, savings and other financial preparation can be done in time to qualify them for a spot in the pipeline. Feb. 1, 2018 - Bay Aging Northern Neck / Middle Peninsula Summit: There were presentations from a wide range of speakers on affordable housing and transportation issues in the area. Feb. 6, 2018 - HOPE, Inc. and Mt. Rogers CSB / Wytheville Housing Summit: Discussions centered on the shortage of market-rate units that can be used to take vouchers for both DD and Section 8 tenants, as well as other affordable housing development needs. Developing a coalition of like-minded groups to make the case for more affordable housing by explaining how communities benefit economically and otherwise. Providing evidence of best practices or examples of jurisdictions that successfully manage growth. Addressing zoning issues around retrofitting motels into affordable housing. Offering legal programs (Know Your Rights) to deal with high eviction rates through improvements to the court system. These events were a great venue for VHDA’s Community Outreach staff to share information about our housing programs and resources. We also established new relationships and identified some potential partnerships. At one event, we visited a fellow attendee’s potential project site to discuss how we might be able to provide them with guidance and assistance. We expect more opportunities to arise as we continue to follow up on information and contacts gathered at these very enlightening sessions. Nearly 22 acres that were formerly the site of Armstrong High School have been cleared to make way for Church Hill North, a wide-ranging redevelopment project that will roll out in five phases, beginning with 256 affordable new homes. Phase One has been issued Housing Credits for the development of 60 mixed-income apartments and 45 homes for seniors, and VHDA has issued commitments for permanent financing. Phase Two, which has similar financing in the works, will add another 70 mixed-income multifamily homes, plus another 45 for seniors. Phase Three will add 36 single-family homes, to be built at one end of the site. Church Hill North will offer a mix of one- and two-bedroom stacked apartments, one-story accessible bungalows, duplexes, townhomes and two-story detached homes. Two centrally located three-story buildings will be dedicated to senior housing, featuring mostly one-bedroom apartments. Site plans include several amenities for the new residents, including a 20,000-square-foot community center and an Armstrong memorial garden to honor the property’s heritage. Approximately one acre is set aside for playgrounds and open space. The project’s final phases will focus on total redevelopment of 30 acres nearby that are now occupied by the Creighton and Whitcomb Court apartment complexes. This will add another 1,000 new homes. The Community Builders estimate completion of all five phases to take eight to 10 years, at a total cost of over $100 million. Church Hill North is destined to change the lives of thousands of Richmond residents for the better by putting more modern and affordable housing within their reach. A retail and residential renaissance is underway on West Main Street in Pulaski, thanks to support from VHDA and other sources of funding. For the past three years, VHDA has been working toward this goal in partnership with West Main Development, LLC. We provided a REACH Virginia Targeted Initiatives Grant to finance their due-diligence work that was needed to select several downtown properties for renovation. VHDA’s REACH Virginia grant program is funded by our own net revenues, and is one of our most important resources for funding our programs and supporting communities poised to make a comeback, like Pulaski. Construction for the Pulaski main street project will be financed by one of VHDA’s longtime financing partners, Virginia Community Capital. After construction is complete, VHDA will provide permanent lending. The former Farmer Building at Nos. 85 and 89 West Main is a single structure with adjacent ground-floor storefronts, which will be refurbished to welcome new businesses. No. 87 is the address for the building’s second floor, which will have two large two-bedroom apartments. Across the street is No. 94 West Main. Its ground-level storefront will house a virtual reality arcade. The arcade is expected to attract students interested in VR development from nearby Radford University, Virginia Polytechnic Institute, and New River and Wytheville Community Colleges, and to become a tourist destination for video game aficionados seeking an immersive experience. The building will also have two residential apartments on the second floor. The buildings at 29 and 69 West Main are also slated for renovations. Once all four buildings are finished, over 15,000 square feet of property will have been reclaimed for new uses. Because the project is receiving both state and federal historic tax credits, the buildings’ original character must be preserved. Apartments will feature the old hardwood floors, casework and interior doors. All storefront exteriors will be restored to their original detail. The Town of Pulaski and local citizens have also been working with the Department of Housing and Community Development and the New River Valley Regional Commission, among others, to make their dream of restoring the area’s vibrancy a reality. Revitalizations like this attract new entrepreneurs and established businesses who want to get in on the action as residents and visitors begin returning to the town’s core. One building at a time, they will make West Main Street once again the place to be in Pulaski. The West Main Development project is tentatively on track for completion in early 2019.